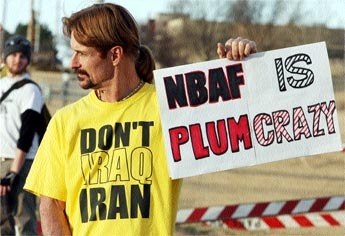 Reader’s Comments to the NRC’s report on the NBAF, Was DHS’s SSRA an inside job? Every once in a while a dialogue comes through (via comments) on a post that is worthy of further debate. Below is just the kind of dialogue I’m refering to. I hope you will agree. The internal DHS Study Committee (SSRA) was about as close to an “inside job” as you could assemble and virtually all of the panelists had glaring conflicts of interest and personal stakes in seeing this project move forward. Both of the USDA “independent experts” on the SSRA, Drs. Cyril Gay and Randall Leavings, were also members of the initial NBAF site visit team. Their efforts as site visit team members, largely informed the decision of siting NBAF in Kansas. They may have also met with Senator Pat Roberts during their 2007 site visits in Kansas. SSRA members Steve Bennett, Dr. Michelle Colby, Dr. Bruce Harper and Dr. Joanne Jones-Meehan are all DHS employees. The notion that they would cast a skeptical eye towards a pet project of the DHS Secretary is laughable. SSRA member Dr. David Brake is a contractor for DHS at Plum Island and his firm would have a vested financial stake in an expanded DHS countermeasure enterprise at NBAF. SSRA member Dr. Josh Fine (SAIC) is also a contractor for DHS at Plum Island. His firm, SAIC, could potentially stand to gain a windfall if selected to provide SETA contract support at NBAF. SSRA member Dr. Ted Schroeder is a professor at Kansas State. No conflict of interest there;) SSRA member Dr. Charles Hobbs is a “senior scientist emeritus” at the Lovelace Respiratory Reserach Institute. Lovelace’s President and CEO, Dr. Robert Rubin, was appointed in 2007 by then-Governor Kathleen Sebelius to serve on the “NBAF in Kansas Task Force.” Of course, there is no chance that Dr. Hobbs would come out against a major policy goal of his instiution’s President and CEO. Other than the two HHS members, the SSRA panelists were riddled with ethical, professional, personal and financial conflicts of interest. A report released today by the National Research Council, solidified concerns brought forth by two grassroot, non-profits who opposed and fought the placement of the National Bio and Agro Defense Facility (NBAF) from being sited in North Carolina and Georgia. Both groups, the Granville Non Violent Action Team (GNAT) and AthensFAQ brought forth the same credible arguments presented in the NRC’s report. The report titled: “Evaluation of a Site-Specific Risk Assessment for the Department of Homeland Security’s Planned National Bio- and Agro-Defense Facility in Manhattan, Kansas” (that’s a mouth-full) was completed by DHS in June 2010. The NRC report finally sheds some much-needed light on DHS’s flawed methodology and skewed data the agency used to justify the NBAF’s risk to near-by communities and livestock populations. Upon review of the DHS assessment, the National Research Council found “several major shortcomings.” Based on the DHS risk assessment, there is nearly a 70 percent chance over the 50-year lifetime of the facility that a release of FMD could result in an infection outside the laboratory, impacting the economy by estimates of $9 billion to $50 billion. The present Research Council report says the risks and costs of a pathogen being accidently released from the facility could be significantly higher. The committee found that the SSRA has many legitimate conclusions, but it was concerned that the assessment does not fully account for how a Biosafety-Level 3 Agriculture and Biosafety-Level 4 Pathogen facility would operate or how pathogens might be accidently released. In particular, the SSRA does not include important operation risks and mitigation issues, such as the risk associated with the daily cleaning of large animal rooms. It also fails to address risks that would likely increase the chances of an FMD leak or of the disease’s spread after a leak, including the NBAF’s close proximity to the Kansas State University College of Veterinary Medicine clinics and KSU football stadium or personnel moving among KSU facilities. Matt DeGennaro of AthensFAQ sums the report up quite nicely, “WE TOLD YOU SO” (and all we had was Google). Critical thinking suggest this report should lay to rest once and for all, the federally funded bio-hazard, right? No, not if the Kansas Congressional Delegation has its way. Absent critical thinking, politicos from the Kansas Congressional Delegation obviously can’t read ! U.S. Senator Pat Roberts knows first hand what an outbreak of FMD would do to his state. Sen. Roberts you see was the President of the U.S. during a government exercise known as Crimson Sky. Here is what he said about the mock FMD outbreak during a Senate Hearing ( To Review BioSecurity Preparedness and Efforts to Address AgroTerrorism Threats). Back in 2002, I joined an exercise held by the department called Crimson Sky. That was sort of a misnomer because it followed the experience of Great Britain in regards to their problems with their livestock herds. They used that method in regards in incinerating the animals, which is probably the worst thing you could have done, as we found out. There wasn’t anybody else in town, so I played the role of President in this exercise, and it simulated the intentional introduction of foot and mouth disease in five different locations. By the way,the person who did that was from Iraq, at least in the exercise. The impact was incredible. In 6 days, if you do not detect the disease, that is when this or the effects of the disease first become obvious, and then it is too late. All of our exports stop. People in the cities discovered that their food doesn’t come from grocery stores, and panic set in. The markets went crazy. Basically, we had States calling out the National Guard. That is when we had the National Guard in the States, not over in Iraq and in Afghanistan and everywhere else, setting up all sorts of border situations so livestock in Texas couldn’t go to Oklahoma; Oklahoma couldn’t go to Kansas; Kansas couldn’t go to Nebraska; etc.,etc. It got pretty rough except everybody finally realized that all of the States were involved and we had to do something. As President, I stopped the movement of all livestock. The Secretary of Commerce said you couldn’t do that. So I fired him, and it felt very good. But it was absolute chaos and not only for 1 year and not only for livestock, but every crop. So if you talk about a real problem, that was a real problem. So, Chuck, can you tell me are you still conducting these kind of exercises? You probably don’t want to have me play President, but at any rate, are we doing the exercises that we need to do in conjunction with your compatriots up there on the panel, and has that impacted the way you do business? Senator ROBERTS. We had to terminate almost every herd in America. I mean that was the end result. It was an incredible experience when you really finally got down to the final answer to stop what was going on. We had to call out the National Guard and call out the military. Quite frankly, we ran out of ammunition. It was a mess, and then you had PETA on television, and I can’t describe the utter chaos that happened. See folks this is the bottom line; Federal grant dollars have a way of creating amnesia. Here we have a person who knows first hand the economic damage caused by a mock- outbreak of FMD in the state of Kansas but continues to push for the NBAF. I don’t live in Kansas but if I did I’d be concerned, very concerned. Maybe real-life is too much for some people to believe, but when you involve their wallets everything changes, doesn’t it Sen. Roberts? Kudos goes to Robert K. Schaeffer of Manhattan, Kansas for a moment of critical thinking regarding the National Bio and Agro Defense Factiliy, (NBAF) and it’s risk to the community of Manhattan,KS. Proponents of National Bio and Agro-Defense Facility argue that the risk is low of accidentally or intentionally releasing lethal pathogens (anthrax, plague) from the germ lab. But it is not up to government officials to assess the level of risk. Instead, the private insurance companies that provide coverage to households and businesses in Manhattan will determine the level of risk. If insurance companies view the risk of NBAF as low — as rare as an earthquake in Kansas — households might pay about 5 percent more on their insurance policies, about $40 a year, according to insurance company estimates. Together, the 19,170 households in Manhattan would pay $766,800 a year, or $7.6 million over the next 10 years, to protect themselves from a big government project that puts their lives and property at risk. But if insurance companies view the risk as high — as risky as a major quake in California — households could see their insurance premiums rise by 60 percent or $480 a year, which would amount to $9.2 million annually or $92 million over the next 10 years. Federal and state officials should answer these questions: Will insurance companies provide coverage for the risks associated with NBAF? How much will premiums increase for households, businesses and Kansas State University? And what will they do if companies refuse to offer coverage or if they charge prohibitive rates? Clearly the NBAF will be a money-maker for all “Businesses”, but what of the communities who will host and fund the facility? Folks in Butner, North Carolina and Athens, Georgia have already spoken, been there and have a T-shirt. What’s the old saying “if it sounds to good to be true, it probably is? Wake-up Kansas! The threat of Foot and Mouth disease for farmers should be a pricey proposition, don’t you think? Or do you? 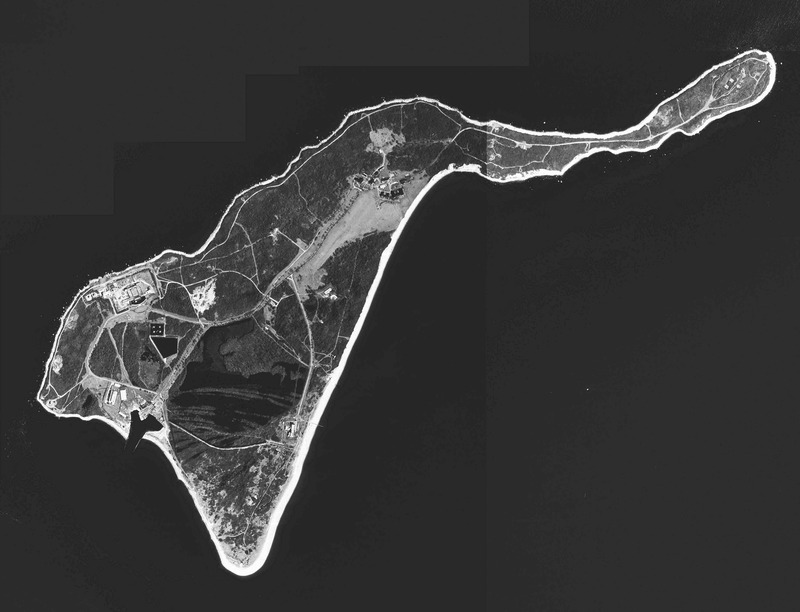 In a Press Release this past week, Congressman Tim Bishop of New York stated that it is “highly unrealistic” that the sale of Plum Island (PIADC) at an “estimated value of $50-80 million could possibly cover the over $650 million cost of constructing NBAF”. “Highly Unrealistic”? You think? On what planet does the sale of a $50-80 million piece of highly contaminated government property pay for the construction of a new $650 million facility? First of all let’s not forget the Congressional Research Service estimated back in 08′ that the clean-up of Plum Island would top $100 million and that was their best estimate at the time. 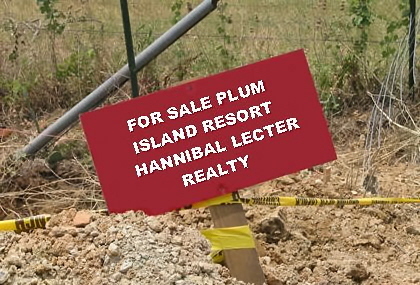 Given our nation’s mounting budget deficits, many have questioned the wisdom of spending approximately $1 billion of taxpayer dollars to create a massive new research facility that would duplicate many of the functions currently served by Plum Island and other existing facilities. Congressman Bishop has the right idea, we should tell Price and the other members of the House subcommittee on Homeland Security we do not support this project. Why? Think of it this way, here we are three years into the project, now Kansas and DHS are pushing lawmakers for a biological TARP bail-out in the name of national security. Or is it really more about research grants and corporate profits? If you’re a critical thinker you already have the answer. Just, where are those Teabaggers when you need them? Adrian Gibbs, the virologist who said in May that swine flu may have escaped from a laboratory, published his findings today, renewing discussion about the origins of the pandemic virus. Earlier this year, during an audit of the nation’s largest Level-4 BioSafety Lab (BSL-4) at Fort Detrick in Frederick, Maryland, 9,220 vials of ebola, anthrax, botulinum, equine encephalitis virus, and other deadly germs were discovered in the proverbial dusty old storage area. No one even knew the vials existed and thus no one knows for sure whether any are missing. Very likely – hopefully – at Fort Detrick they did. But the most important question remains unanswered: can any BSL-4, the labs with the deadliest, often highly contagious, bacteria and viruses, ever be truly fail-safe? After all, at some point that old storeroom in Fort Detrick was state-of-the-art. Human error applies not only to daily procedures, but to equipment that always seems so pristine when new. 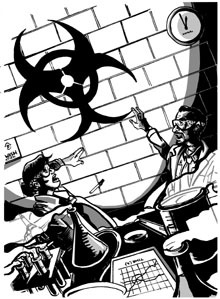 Proponents of BSL-4s argue that without these research labs we stand defenseless against a natural outbreak of disease or bio-terrorist attack. And, they say, the labs are so safe that the chances of a disease-spreading breach approach zero. The problem is, neither of these assertions is strictly true. Vaccines against Level-4 Ebola and Marburg viruses have been developed in Level-2 labs by inserting their DNA into non-pathogenic viruses that can trigger immune responses just as definitively as the deadly pathogen. Scientists can therefore develop vaccines against deadly bacteria and viruses without actually handling the germs themselves. And the Level-4 labs may very well make our world more dangerous rather than safer and more secure. However modern and up-to-date a laboratory, it is still subject to human error, violence, neglect, and systemic breakdown. The Foot and Mouth Disease (FMD) outbreak in Great Britain in 2007 was due, according to the British government’s inquiry, to “poor training and incompetence” and a “creeping degradation of standards”, while the 2001 outbreak was attributed by the government to an employee who smuggled out a vial of FMD from his lab. “Creeping degradation” is probably responsible for most industrial and infrastructural accidents. 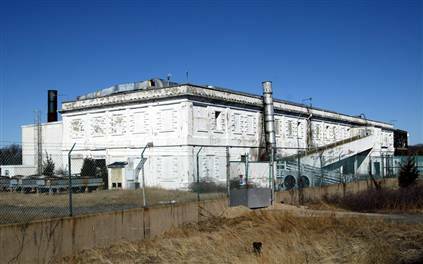 The case of Plum Island off the northeast coast of Long Island, New York, home to a now-closed Level-4 lab, illustrates the problem. Many believe Plum Island responsible for Lyme Disease, borne by deer swimming five miles from the island to the Connecticut coast near Lyme where the first outbreaks occurred. Lab 257 by Michael Carroll details how protocols and procedures at Plum Island eventually unraveled. Countless small oversights and flaws in equipment, procedures, and human judgment tend to build up over time to generate distinct vulnerabilities until an otherwise controllable opportunistic event spins out of control. It is often claimed that BSL-4s have a flawless safety record, although the 9,220 recovered vials seem to undermine that claim. More importantly, only two Level-4 labs have operated in the United States until recently and their documentation has been in disarray, as Fort Detrick’s spokesperson admitted to explain how the vials went missing. There is, in fact, no real documentation that BSL-4 labs have been operating safely. As with the oft-ignored low-level radioactive releases from nuclear power plants, small accidents can be ignored or covered up; it takes a major disaster to enter public consciousness. Recently, the city of Boston had to admit that the news of the infection of three BSL-2 lab workers in a lab had been suppressed by the lab and city officials. Mayor Menino assured us that if the public had been in danger, they would have told us sooner. Granted, Level-2 labs are not built to be foolproof and the diseases harbored there are far milder than in BSL-4s, but when infection at a BSL-2 is kept under wraps, would a more serious threat have been publicized, especially with no real emergency response mechanism in place in most communities? According to the Sunshine Project, “Three Texas A&M University biodefense researchers were infected with the biological weapons agent Q Fever in 2006. The infections were confirmed in April of that year, but Texas A&M officials did not report them to the Centers for Disease Control (CDC), as required by law. Instead, Texas A&M officials covered the infections up until now, illegally failing to disclose them despite freedom of information requests dating back to October 2006.” This was in addition to a brucella infection at the lab, news of which was also withheld from the public. In response to these events, the Center for Disease Control ordered the lab to shut down its bioweapons research, citing – in a detailed report issued August 31, 2007 – a host of violations of basic safety protocols at the lab. Other accidents at BSL-3s have recently occurred at the University of New Mexico (anthrax, 2003 and unidentified pathogen in 2004); Medical University of Ohio (2004, Level-3 Valley Fever); University of Chicago (2005, Level 3, possibly anthrax or plague); and UC Berkeley (2005, Level 3 aerosolized, weaponized Rocky Mountain Spotted Fever). From 2005-2006, University of Wisconsin at Madison (UW) researchers made and manipulated copies of the Ebola virus genome even though the federal government stipulates that such research must take place at a BSL-4. (It should be noted that Level-3 pathogens can be every bit as dangerous as Level 4s and include many of the more contagious germs; it’s just they’ve been shown to respond to antibiotics). All these cases occurred after 2001, when the through-the-mail anthrax attacks supposedly led to tighter security and more sophisticated protocols at BSL-3s and BSL-4s. The dangers posed by biolabs often fly under the radar, but that may be changing. The General Accounting Office, in a report released this past September 21st, stated that the rapid – and often unregulated – proliferation of Level 3 and Level 4 labs places the public at significant risk. The public would do well to question the knee-jerk “security at all costs” policy of the federal government which threatens to build up stores of the world’s deadliest organisms across the United States. As for proponents’ arguments that the labs are absolutely safe and absolutely necessary, we shall address them soon in another post. A hearing slated for later today will examine the latest findings made by the Government Accountability Office (GAO) regarding the oversight and expansion of high-containment laboratories in the United States. In their report, the GAO focused on the Bio-Safety level 3 & 4 laboratories both operational and planned i.e. National Bio and Agro Defense facility (NBAF), for obvious reasons; these facilities conduct research on the deadliest most dangerous pathogens or select agents. Interesting enough, was GAO’s cited reason for the study; “public concern” regarding over-sight and accidental or intentional release of select agents. In short, opposition to these facilities nation-wide has turned those “living in the shadows” into activist, lobbyist and educators, all working to prevent or stop construction or expansion of the biolab slated for their area. U.S. laboratories working with dangerous biological pathogens (commonly referred to as high containment laboratories) have proliferated in recent years. As a result, the public is concerned about the oversight of these laboratories. The deliberate or accidental release of biological pathogens can have disastrous consequences. Ample evidence exist and experts agree that many incidents or accidents go “unreported and unrecorded”. Consider the Sunshine Project’s investigation into Texas A&M, Ed Hammond uncovered a serious incident that even the CDC; which regulates some of these facilities, missed. Texas A&M ended up paying a $1 million dollar fine for the incident but the findings by Hammond suggested that far more incidents are taking place than the public knows, which if left “as is” puts us all at risk. Consider the following from a report by the Congressional Research Office’s, Issues for Congress report released in June of this year. The experts we spoke with also stated that it is highly probable that many incidents go unreported and unrecorded because of the lack of such serious consequences. Such underreporting represents lost opportunities to analyze and learn lessons that can provide a basis for continuing improvement and maintenance of laboratory safety. We as a Nation cannot continue to ignore issues at hand with regard to the operation of high-containment laboratories and their dual -use research. It is, pardon the pun a double-edged sword for all concerned but Congress must act on the recommendation of the GAO once and for all before it is too late. The recent expansion of high-containment laboratories in the United States began in response to the need to develop medical countermeasures after the anthrax attacks in 2001. Understandably, the expansion initially lacked a clear, governmentwide coordinated strategy. In that emergency situation, the expansion was based on individual agency perceptions of the capacity their highcontainment labs required as well as the availability of congressionally approved funding. Decisions to fund the construction of high-containment labs were made by multiple federal agencies in multiple budget cycles. Federal and state agencies, academia, and the private sector considered their individual requirements, but an assessment of national needs was lacking. Even now, after more than 7 years, GAO was unable to find any projections based on a governmentwide strategic evaluation of future capacity requirements set in light of existing capacity; the numbers, location, and mission of the laboratories needed to effectively counter biothreats; and national public health goals. Such information is needed to ensure that the United States will have facilities in the right place with the right specifications. A national strategy is needed for overseeing the expanding number of laboratories designed for research on the world’s deadliest pathogens, the Government Accountability Office said Monday. Since the fatal anthrax attacks of 2001, the number of so-called high-containment labs has increased, but no federal agency knows whether their number meets or exceeds the national need or is at a level that can be operated safely, the GAO said in the 104-page document. The federal watchdog agency recommended that the White House national security advisor, in consultation with the National Intelligence Council and the secretaries of health, agriculture, defense, and homeland security, identify a single entity to oversee the growth of high-containment labs. The overseer would determine the number, location, and mission of the laboratories needed to effectively counter biological threats. It also would analyze the risks associated with the laboratories’ expansion and determine how much oversight is needed. The agency would then develop national standards for designing, building, commissioning and operating the labs. High-containment labs are rated either Biosafety Level 3 (BSL-3), for work with agents such as anthrax and tuberculosis bacteria that may cause serious illness or death if inhaled, or BSL-4, which is reserved for potentially lethal agents that lack vaccines or other treatments, such as the Marburg and Ebola viruses. Workers in BSL-4 labs must wear protective suits with a self-contained oxygen supply. For most of the past 50 years, only two U.S. entities had BSL-4 labs: the Army biodefense center at Fort Detrick in Frederick, Md., and the Centers for Disease Control in Atlanta. Three more were built between 1990 and 2000, at Georgia State University in Atlanta; the University of Texas Medical Branch in Galveston, Texas; and the privately funded Southwest Foundation for Biomedical Research in San Antonio, Texas. Since the 2001 anthrax mailings that killed five people and sickened 17 others, seven new BSL-4 facilities are in the works. Three will be at Fort Detrick, including a replacement for the existing lab there. The others will be in Manhattan, Kan.; Boston; Galveston, Texas, and Richmond, Va. The GAO said no one knows how many BSL-3 labs exist or are planned, since only those that work with dangerous “select agents” must register with the CDC. The number of registered BSL-3 labs rose from 415 in 2004 to 1,362 by 2008, the GAO found. The report comes on the eve of a Senate subcommittee hearing on biolab security, and a National Research Council review of health and safety risks at an Army biodefense lab under construction at Fort Detrick in Frederick. For filmmaker Bob Coen, who was raised in Zimbabwe where the former white regime has been accused of unleashing anthrax against the black population, biological weapons have a deep personal meaning. He embarks on a journey that raises troubling questions about the FBI’s investigation of the 21st century’s first act of biological terrorism. Coen’s investigation takes him from the U.S. to the U.K. and from the edge of Siberia to the tip of Africa. In a rare interview, Coen confronts “Doctor Death” Wouter Basson, who headed Project Coast, the South African apartheid-era bio-warfare program. Project Coast used germ warfare against select targets within the country’s black population. Anthrax War also investigates the mysterious deaths of some of the world’s leading anthrax scientists, including Dr. David Kelly, the UK’s top military microbiologist, the Soviet defector Dr. Vladimir Pasechnik, and Dr. Bruce Ivins. The FBI claims – despite the doubts of highly ranked U.S. officials – that Ivins was the only person behind the U.S. anthrax murders. Here is Anthrax War, presented in 6 parts.